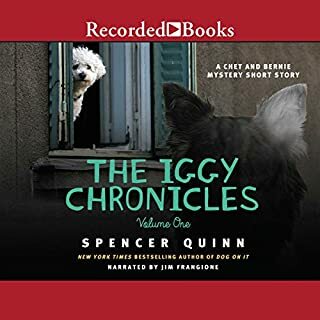 In the seventh book in the brilliant New York Times best-selling mystery series, canine narrator Chet and P.I. Bernie journey to Washington, DC, and the dog-eat-dog world of our nation’s capital. Stephen King has called Chet "a canine Sam Spade full of joie de vivre". Robert B. Parker dubbed Spencer Quinn’s writing "major-league prose". Now the beloved team returns in another suspenseful novel that finds Chet sniffing around the capital city and using his street smarts to uncover a devilish plot. Chet and Bernie pay a visit to Bernie’s girlfriend, Suzie Sanchez, a crack reporter living in far-off Washington, DC. She’s working on a big story she can’t talk about, but when her source, a mysterious Brit with possible intelligence connections, runs into trouble of the worst kind, Bernie suddenly finds himself under arrest. If you are new to the world of Bernie Little (Hawaiian-shirt wearing Arizona P.I.) and his intrepid partner, K-9 flunkee (there was a cat involved, enough said) Chet (the Jet), I urge you to give this book a try. Although it is the 7th of the series (and Chet often refers to past cases in his mental soliloquies), you can easily start with this book. 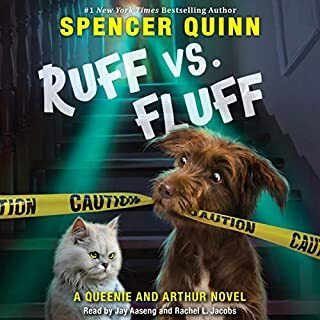 Spencer Quinn is as reliable a writer as David Rosenfelt -- I always know what to expect and am never left wanting, saddened only in knowing I will need to wait for my next Chet and Bernie adventure. The books are told from the point of view of Chet, which can be puerile or overly sentimental in the hands of less skilled writers. Quinn gets Chet just right, "plain and simple." If you have ever looked into your dog's eyes and wondered what he was thinking, this book is for you! Could your sleeping dog's whimpering be caused by a nightmare of a javelina with buzzsaw tusks? I just love Chet! The mystery isn't overly complex, so if you are looking for twist and turns and surprising denouements, you can skip this one. 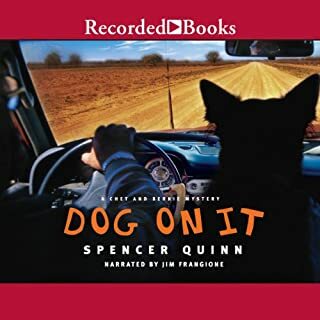 If you are looking for a delightfully fun romp in the world of Chet and Bernie (this time in the mean streets of Washington, D.C, where Bernie's girlfriend Suzie Sanchez is working as a reporter), give this one a try -- it is worth a credit. The narrator, Jim Frangione, IS the voice of Chet and does well with Bernie's vocalizations. However, his delivery of some of the accents (two of the British characters don't sound very British) is subpar. But, he is so perfect as Chet, the few shortcomings did not detract from the overall delivery. Okay, I am a dog fanatic. So my rating is less influenced by the story (which I like and would rank among the better ones in the series despite what some other reviewers are saying) but the description of Chet's way of thinking. 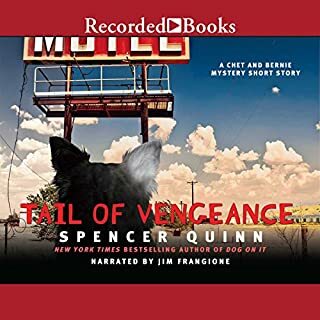 I must admit that I found the last couple of books less enjoyable but this time around Spencer Quinn is back to form and absolutely nails it. I know this is EXACTLY how my dogs think :-) I couldn't stop smiling and often had to laugh out loud. It's just perfect. And credit where credit is due: Jim Frangione is also on top of his game and delivers Chet's lines impeccably. Chet's viewpoint is what is precious, but after that. the plot seemed idiotic. Placing it around D.C. was stupid, get back to the desert and find the off-spring of Chet's ability to jump fences to find that female in heat. Quonn has gone astray here - his super hero is Chet, and his brain interpreting events and the "moment". He totally lost that in this book. Have you listened to any of Jim Frangione’s other performances before? How does this one compare? 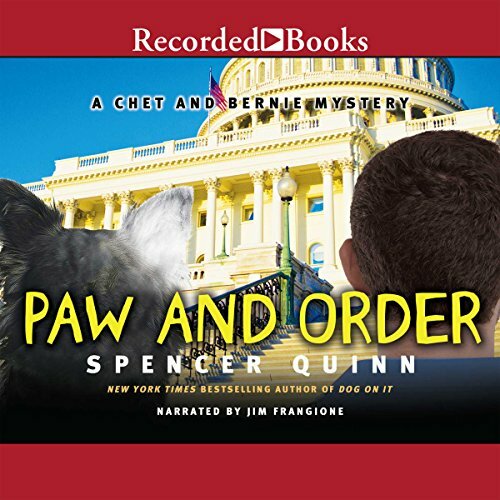 Do you think Paw and Order needs a follow-up book? Why or why not? Yes, but if he only get backs to the desert and wonderful connection with Chet and his thoughts. Loved the idea of their adventures from Chet's viewpoint and finding his off-spring. His love life is a side issue. The joy of us books are between him and Chet. Quinn went way astray here. I have enjoyed all of the books in this series, and this one was my favorite. Having read the first 2 I began listening to the remainder in audio form, and, due in large part to Jim Frangione's reading, would not go back to book form. Great character development, laugh out loud dog antics and an intriguing I spy plot. Another Jem to the series. Another Chet and Bernie adventure, whose only fault was that it ended and I have to wait for another. I just wish I found these 10 years from now, so that I'd have 20 books to read without waiting. Actually, there was only one surprise that chaffed me and that was Chet using adult language when describing annoying critters. Not very Chet-like. Other than that, I'm good to go. When is the next one? So refreshing to be back in Chet's head again, which is what I love most about this series. For me it's never about the plot, always about Chet's world view: if something is bad, he's good at forgetting it - ooo look! A squirrel! Smell that! Isn't life awesome? Now if I can just master his thought process I'd be a lot happier. Oooo guinea pigs!! I've really liked the series so far, but this one didn't catch me like the others. Too much told from Chet's viewpoint, not enough story. Wonderful "fix" for my Chet & Bernie addiction! In this book, Bernie and Chet have driven to Washinton, DC to see Susie Sanchez--Bernie's reporter girlfriend. En route, they have a brief encounter during which Bernie has felt it necessary to relieve someone of a small gun with a pink pearl handle. Later this will come back to haunt him, when he gets arrested for the murder of one of Susie's contacts. 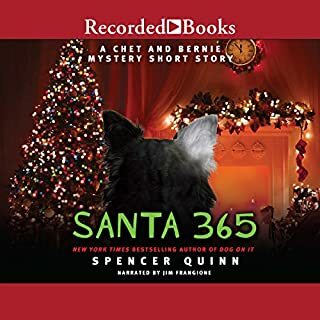 Chet meets a strange person who takes an interest in him, keeps trying to think of a way to communicate to his humans about a strange bird he keeps seeing and the guinea pig he keeps smelling, while Bernie vows to to find who actually has killed Eben St. John. Chet has the cleverest and funniest way of understanding what humans do, makes one stop and think about how we appear to our furry friends. I guess this could have been called, "Chet and Bernie Do DC," and it is just as much a winner as all the others have been. 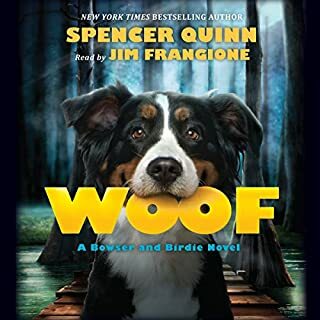 Spencer Quinn has a great way of imagining a dog's point of view, and Jim Frangione is such the perfect narrator, that if he were ever to stop being the voice of Chet, I'd have to go to reading them in print, because nobody else could ever duplicate his unique skill at doing all the voices! If you like dogs, like to laugh, like to listen to a happy, feel good story, don't miss this one. It's totally great! Highly, highly recommend! seems like Mr Quinn was on a deadline, craming all the facts into the final chapter. Always fun. Chet and Bernie tackle the capitol. Having Chet narrate always adds a great bit of humor to the story. If only dogs ran the world.